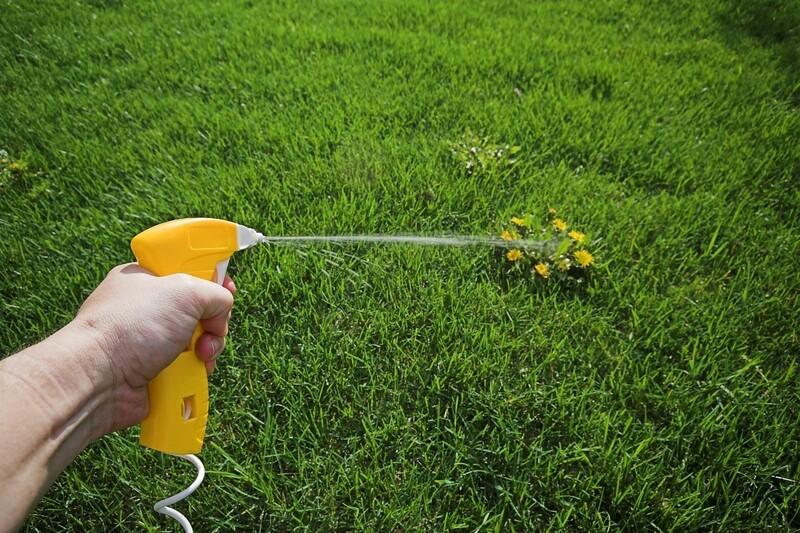 Only certain formulations of weed killers will work to kill weeds but not your lawn. This is a guide about weed killer that won't kill grass. What can I use to kill blackberries and thistles, but not kill the grass? Look for a broad leaf weed killer that is labeled safe for lawns. Most of the phenoxy herbicides (2,4-D, dicamba, MCPA, etc.) will do minimal damage to grasses and take care of the broad leaf weeds just fine. Blackberries will be very hard to kill - many repeated applications of the weed killer will be needed! Black berries are indeed hard to kill. Some areas in Washington state and Oregon have gone to pasturing goats in these areas. Goats naturally will eat the berry bushes first over grass. By keeping the leaves stripped off the plant and eating the new growth they eventually starve the plant to death. This has happened on my own property when I moved my goats into a pasture with wild roses, russian thistle, mint, snap weed, and cat tails. 3 years later I have a pasture that is primarily grass and clover, the stream is no longer chocked with cat tails and best of all, happy goats. I have lots of weeds growing in my front yard. What can I use to kill them without killing the grass? Q: Killing weeds without killing grass: I need a natural homemade weed killer that will kill weeds but not the grass. All I have seen are recipes for non-selective killing. Can anyone help, this must be the best kept secret by the big boys. Q: When I moved into my house in 2000, I had a flawless St. Augustine yard. I choose not to use chemicals so I am looking for a natural recipe or product that will kill weeds and not my grass. The grass is thatchy and has browning spots with more and more weeds every year. I only have used Hasta Gro Lawn Feed so far. It helps some, but my yard is getting uglier every year. Because you're essentially both asking the same question, I'm going to answer both questions together. While I can't say exactly what the big boys use, I'm not aware of any weed killers (natural or synthetic) that will kill weeds while sparing grass and ornamental plants. Feeding your yard is great, but a few more steps are needed if you ever hope to restore your lawn to its former glory. Find out which types of weeds are invading your lawn so you can plan an effective strategy. For example, certain broadleaf weeds thrive in heavy, compact soil. Aerating your lawn can discourage them from taking hold. Mow high. Encourage grass to crowd out the weeds by waiting until grass is 4 1/2 inches tall and then cutting it to no shorter than 3 inches. Many people balk at this and it's hard to get used to at first, but it really works. Cutting grass shorter (more than 1/3 of the blade) only stresses it out and gives encroaching weeds the advantage. Also, keep you lawnmower blades sharp. Leave clippings on your lawn. They act like a fertilizer. Aerate your lawn. Ideally, this is done by renting a core aerator (best), but it can also be done by hand with a pitchfork or by foot when wearing aerating sandals. What you're shooting for is dime-sized holes every few inches to reverse the effects of soil compaction. Aeration allows moisture to reach the root zone and provides a place where grass seed favors sprouting. Most homeowners vastly under estimate the effects aerating has on the health of their lawn. Add 1/4 inch layer of compost to the lawn in the fall. In a few days it will work its way down into the grass and you won't even see it. Your lawn will love you for it next spring. Hand-pull weeds when possible or look for weed-specific hand tools to help do this. Reseed bare patches. Overseed thin areas in the fall (mid-August to mid-September). Make sure you use the appropriate grass seed to your light conditions and intended use. Spot spray vinegar in sidewalk cracks. If you're patient, in a few seasons your lawn will be lush and virtually weed-free and you'll be spending a lot less on chemicals. A lawn that is about 15% weeds will look weed-free to the average observer. About The Author: Ellen Brown is our Green Living and Gardening Expert. Ellen Brown is an environmental writer and photographer and the owner of Sustainable Media, an environmental media company that specializes in helping businesses and organizations promote eco-friendly products and services. I was told by my gardener to just pour boiling water on the weeds, both in the lawn and on paths. Good Luck.